In the growing list of cards I've made with no hope of getting autographed add a 1988 Topps style Ronald Reagan to the collection. Most of my cards are '80s-centric and President Reagan is right up there with Madonna and Michael Jackson as far as being identifiable with the decade. 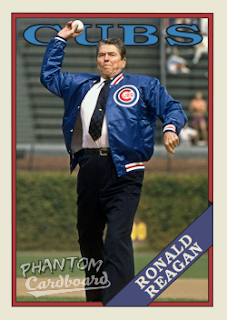 "The Great Communicator" threw out the ceremonial first pitch at Wrigley Field in a late season Cubs - Pirates game. Mr. President actually threw two pitches, not being satisfied with his first. 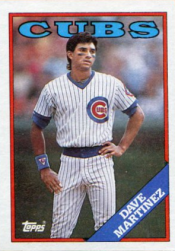 If this was a real card back in 1988 it probably would have been my favorite card. I could just see myself being overly excited about a card of the POTUS playing baseball. ... A little known fact is that after graduating from college in 1932, Reagan started out as a sportscaster at WOC Radio in Davenport, Iowa. WOC later consolidated with WHO in Des Moines, and Reagan gained national media exposure recreating Chicago Cubs baseball games from the studio. He became a lifelong Cubs fan due to this early affiliation to the team.